It’s definitely a nice touch for the trophy to be put on display just outside the tunnel as the teams take to the field before a big match in any sport. However, it takes the shine off the custom a tad when one of the two teams already knows they’ve won it before a ball is kicked! We went into this Day 3 of the Tbilisi Cup with an unassailable 6-point lead over the other three teams. So given how this match ended in Allen Clarke’s side third convincing win in a row earning them a maximum 15pts, an average 5 tries scored and 1 conceded per match and an average winning margin of 28pts, you may be forgiven for wondering if this exercise was really worth it for the players involved. Well I must admit I wasn’t exactly a believer in this “Emerging” concept for Irish rugby when it was first mooted in 2013. Two Six Nations titles and a rise to 3rd in the world ranking later, however, I have been completely won over to the idea. Now it’s true, when most Irish players dream of donning a green jersey for three matches in June the setting would probably be somewhere like Auckland, Sydney or Cape Town, but with those venues not on the table for summer tours this year, Tbilisi was certainly as good a spot as any for this crop of talent, many of whom were bright sparks in a mostly below-par season for the provinces. I know I’m going to leave out a host of worthy names here but to give but one back and one forward as examples from each province, there’s Matt Healy and Denis Buckley from Connacht, Stuart McCloskey and Rob Herring from Ulster, Andrew Conway and Billy Holland from Munster and Noel Reid and Jack Conan from Leinster. As Joe Schmidt & his coaching staff looked on, it certainly must have given them heart to see so much talent on the fringes of the senior squad. And whatever about the quality of opposition, while the 240 minutes in Tbilisi weren’t exactly perfect, the overall performance was enough to suggest a large chunk of the players are ready to step up should they be required from August onwards and you certainly can’t ask for much more than that. To be fair to the Georgians, despite the “futility” of this fixture from a tournament-winning standpoint, they seem to have hyped it pretty well to the locals who seemed in good voice and also to their players, who hit the ground running by playing to their strengths in the forwards, winning a penalty at the first scrum and powering over the line for the game’s opening score after just 7 minutes courtesy of Béziers Hérault’s Lasha Lomidze. And there were 17 minutes on the clock before the Irish troubled the scorers with a JJ Hanrahan penalty - if I was to have one major worry about us ahead of the World Cup it’s how we react to a game that we don’t manage to take by the scruff of the neck after the opening exchanges (Cardiff this season a perfect example of what can go wrong) but on this occasion we were able to deal with the early adversity. It took us until the half-hour mark to turn our gradual increase in possession and territory into a lead on the scoreboard as our own forwards earned a penalty try, but as far as this match was concerned it was pretty clear the writing was on the wall. 10-5 ahead at the interval gave the impression that the result was in some doubt but a scintillating line from Matt Healy put it to be shortly into the second half. Maybe he won’t quite make it as a “bolter” to Joe Schmidt’s squad but you can definitely use the word when referring to Healy’s pace and he has impressed of late both for Connacht and Emerging Ireland. He certainly caught the eye over the three matches and is going to cause the Westerners' opposition many more problems next season. Another area we had control was in the back row where Conan and Dan Leavy did well in an area where we could have struggled without the squad captain Rhys Ruddock who had to go home early to see if his arm has a chance of healing in time to join the senior squad. We grew our way back into this match mostly due to their tenacious attitude around the breakdown. Also on the injury front it was also a shame to see Ruddock’s replacement as skipper go off so early - hopefully Billy Holland will be able to return to action soon. 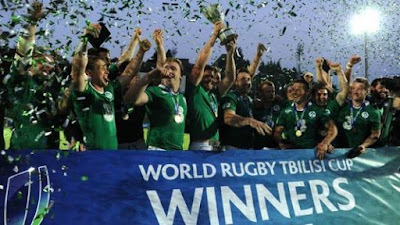 But what impressed me the most about this Emerging Ireland side over the three matches was the team effort and while Joe didn’t join up with them until the final day, you could definitely see his influence was filtering through and the cohesiveness from 1 to 23 in each encounter was the difference in the tournament and led to the convincing results. The pick of the Irish tries yesterday came from Eoghan Masterson who touched down after a superb team effort from deep involving all four proud provinces with contributions from Hanrahan, Healy, McCloskey, Archer and Conan. Georgia gave their fans something else to cheer about with a second try from their pack but by then the match was over and the icing to the cake was provided by Finlay Bealham who got our sixth try near the end, and all of our five-pointers were converted by Northampton-bound JJ Hanrahan. So another trophy for the cabinet, and with both men’s and women’s 7s teams also lifting silverware over the weekend, it hasn’t been a bad spell for Irish rugby - even the Under 20s who had a few bumps along the way finished their World Championship campaign with a victory. All of this positivity is more than enough to help me get through the summer months, as we as Irish fans mentally prepare ourselves for the World Cup. As far as I’m concerned, we need to rid ourselves of this traditional Irish tendency to talk ourselves down. If Joe Schmidt is to demand “ehkrissy” from his players, then so should we, and a fair amount of belief should go with it. But I’ll be harping more about that when we’re into the pre-tournament “warm-up” phase. For now we can finally put away the Irish rugby jerseys for a few weeks to regroup (at least for the 15s game...best wishes to the 7s squads who are bidding for Rio). That’s not to say there’s no egg-chasing to enjoy between now and August, however. There’s to be plenty going on in the southern hemisphere in that time to give us a good sense of what we’ll be up against at RWC2015. Next week our Monday match writeup will feature the Super Rugby semifinal between the Waratahs and the Highlanders.